Reader Submission: Stop means Stop? This is Brown Street at Angell Street. I am so old I remember when “Cross Traffic Does Not Stop” was exactly what you could figure out for yourself when you saw a STOP sign. Good times. City spent less money on signs back then, too. 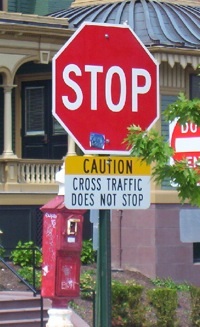 The reason for this odd “Cross Traffic Does Not Stop” sign would appear to be for the fact that cross traffic used to stop. For a while, when Brown had much more construction going on in this area, this was a 4-way stop sign (or 3-way actually since Angell is a one-way street). But not for very long actually, and for much of the time, Brown Street was closed, and even when Brown Street was open, there was often an officer at this location directing traffic. Perhaps the over-proliferation of 4-way stop signs in the city is causing drivers to disrespect stop signs, assuming they can roll because on-coming traffic will stop because seemingly all stop signs in the city are 4-way. The colloquialism that ‘familiarity breeds contempt’ can help to explain why stop signs are almost universally (in terms of location, not users) disrespected in the US. For example: the criteria for the placement of an all-way stop might only take into account peak conditions, meaning a stop might only be necessary at peak times at an otherwise highly visible intersection. Legally obligated, but ostensibly unnecessary, frequent stopping can indirectly encourage faster and possibly illegal driving between stop signs. A driver traversing mostly roundabouts will, having likely not stopped, not have an incentive to speed and will be more receptive to a stop sign placed for actual safety needs, like because a yield/give way sign is insufficient. Despite the law, stop signs in the US are indeed violated in all manners, usually by simply not completely stopping, what is known as a rolling or California stop amongst other names. In the USA the Federal Highway Administration’s Manual on Uniform Traffic Control Devices defines the standards commonly used for the application of all-way stops. According to the MUTCD such applications should be based on a traffic engineering study. These intersections are often found (in accordance with the MUTCD) where roads with considerably equal traffic levels meet each other but the overall level of traffic present at the intersection does not justify a traffic light, and or in a location where previously the right of way was unclear and concerns regarding the safety of users, especially pedestrians, exist. Other criteria might include a history of bad accidents in a given period, an interim measure preceding the placement of a traffic light, the presence of many pedestrians at any given time, high minimum traffic volume during a given period of a day, or where traffic is frequently delayed by turning conflicts. Additionally the MUTCD advocates the placement of all-way stops at intersections between through roads in residential areas if an engineering study can show that traffic flow would be optimized. Many jurisdictions, especially local ones in the USA arbitrarily place stop signs at many intersections, especially residential ones. Using the East Side as the example, I find it highly unlikely that all the 4-way stops were the result of an extensive Traffic Engineering study, there’s no indication that any are temporary measures ahead of the installation of traffic lights, most seem quite clear which street is the main street and should have priority, and though due to the colleges, pedestrian activity is quite high on the East Side, as a pedestrian, there are few intersections where I have trouble crossing (except perhaps Benefit at College where there is a 4-way stop and drivers are very aggressively trying to assert priority and paying little attention to pedestrians). Slapping up a stop sign seems to be Providence’s answer to traffic calming (regardless of if traffic actually needs calming) when other measures, such as striping roads and crosswalks, installing curb extensions, etc. would be more prudent. The slap up a stop sign theory seems to do little more than lead to frustrated drivers, a lack of respect for stop signs, and superfluous and confusing signage as seen above. Well, if drivers treated stop signs as an actual full, complete stop, and used that moment to determine whether the cross street had a stop sign, this wouldn’t be necessary. I’ll agree and disagree with A.’s point: yes, technically drivers should come to a complete and full stop at each and every stop sign; however, saying “if everyone just followed the rules” isn’t going to help anything. As the poster says, “The slap up a stop sign theory seems to do little more than lead to frustrated drivers, a lack of respect for stop signs, and superfluous and confusing signage as seen above.” Yes, drivers (me included) don’t get to pick and choose which signs they obey, but we can point out that many of those stop signs don’t belong there in the first place. I think the real problem stems from the Providence Police basically ignoring traffic violations. The police should be enforcing traffic laws much more in order to set the expectation that if you speed or ignore markings, you -will- get ticketed. Instead, I feel that the Providence Police have more of a ‘big city’ attitude, that they’re around to catch ‘real criminals’ and not enforce traffic laws. I’ve noticed the proliferation of stop signs on the East Side over the past few years, and so many of them honestly don’t make any sense. Four-way stops -do- breed contempt, as far as I can tell. I feel that the Providence Police have more of a Ã¢â‚¬Ëœbig city’ attitude, that they’re around to catch Ã¢â‚¬Ëœreal criminals’ and not enforce traffic laws. I always stop at stop signs because even though they make me nuts, I assume someone is going to run it. Especially at the intersection of Eagle and Valley Streets. I have been nearly hit about 60% of the time I go through that intersection. There are standards called “4 way stop warrants” that are supposed to be met before the installation of a 4 way stop, just like there are signal warrants that must be met for traffic signals to be installed. I bet few of the stop signs on the east side (especially along streets like Wayland Ave) are warranted.